You don’t have to major in music to reap the benefits of music lessons. You don’t even have to get very good at it. A few weeks ago on Facebook I found my first piano teacher. I only took lessons from her for about two years, but almost 45 years later I still have a clear picture in my mind of the petite and pretty young blonde woman who first showed me how to put my thumbs on middle C.
Turns out she was only 19 when she took me as a student, although she seemed very grown-up to my 5-year-old self. When she married and moved away I nervously started taking lessons with her mother, who taught on the big piano in the fancy room with the silver tea service instead of on the spinet in the basement. As a result of those early lessons, piano, and music in general, became a lifelong pursuit. I got a degree in music and have made good personal and professional use of it for 30 years. But even if I hadn’t done so, I would still be thankful for parents who believed paying for lessons for all those years was worth it. You don’t have to major in music to reap the benefits of music lessons. You don’t even have to get very good at it. Below are six reasons everyone should take music lessons at some point in their lives. A quick Internet search yields multiple articles about the benefits of music study on the physiology of the human brain, on overall cognitive functioning, and on learning and academic performance in subjects other than music. 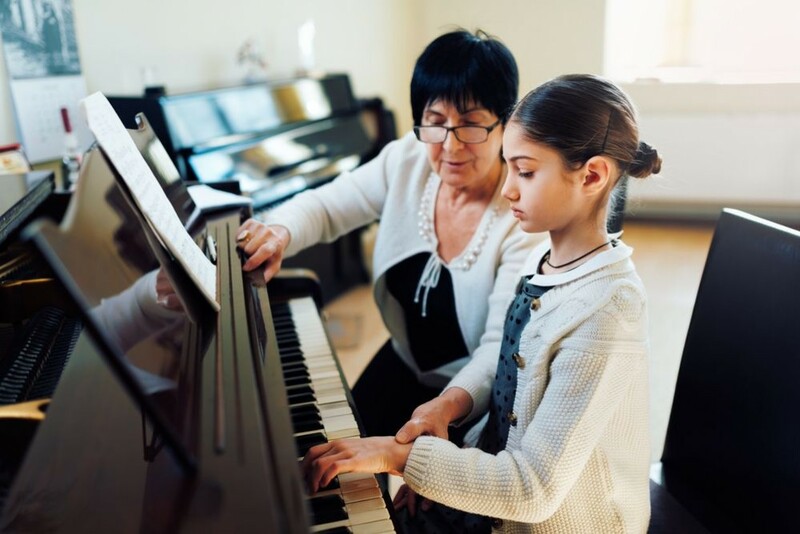 It appears that the greatest impact on brain development occurs in those who begin taking lessons before age 7, but studies have also shown the positive effect of music lessons on the aging brain, even if those lessons don’t happen until later in life. Not only does music strengthen the brain, it strengthens the rest of the body. The emotional and psychological benefits of music are obvious to anyone who has ever been cheered up or calmed down by listening to a beloved song, but there is good reason to believe music also benefits those in need of pain management and immune functioning as well as to the human nervous, skeletal, and cardiovascular systems. Learning to play an instrument is hard work. It requires a sustained investment of time and effort. That investment pays off not only in attaining a valuable skill, but in cultivating character traits that apply in all areas of life. In learning to play an instrument, one also has multiple opportunities to learn self-discipline, self-confidence, deferred gratification, intrinsic motivation, perseverance, creativity, respect for others, and humility. We all know the musician is the life of the party, right? But you actually don’t have to be able to play very well to experience that truth. I can’t tell you how many times as an accompanist I have been sitting at the piano in a school chorus room when a student has approached me and asked permission to play. Within moments, a small crowd has gathered. The onlookers don’t care that the young musician may be playing the simplest of melodies with only one finger (and plenty of mistakes). They just want to be a part of the music-making. In quick succession, others take their turn. Clearly, humans are wired to make music together, and they jump at any opportunity to do it. Just ask anyone who’s ever been in a band. Or ask my husband. I fell in love with him about 32 years ago, right after he sang and played Elton John’s “Your Song” for me after his college piano recital. But again, you don’t have to be skilled to test this theory. Next time you’re bored by the conversation at a party, head for the piano. Play the song you’re learning in your music lessons. It doesn’t matter if it’s “Three Blind Mice”—play it. (If you’re not taking piano lessons, make something up.) Then wait for someone to come. It might be someone worth getting to know a little better. One of the pitfalls of our technologically advanced, increasingly computerized society is its capacity for discouraging certain human activities. Our kids don’t learn handwriting anymore because they do so much schoolwork on computers. We can’t multiply and divide anymore because we have calculators to do it for us. And we don’t learn how to make music anymore because the professionals and their synthesizers are so much better at it. On the other hand, beginning method books for piano and other instruments typically draw on melodies from great, canonical music rather than from MTV. A child who takes private lessons will be exposed to music he might not otherwise ever hear. If I’ve succeeded in inspiring you, it’s time to find a teacher! Start by asking the musicians in your life. If you don’t know any musicians, call the nearest university or community college. Community colleges, especially, are often music hubs, with choirs that are open to the public and inexpensive group or private lessons offered in many instruments. If the school in your area doesn’t teach what you’re looking for, it may at least be able to point you in the right direction. In arguing that everyone should take lessons, I realize that not everyone can. Music lessons cost money, not only for the lessons but for the instrument. Sometimes there is not a teacher to be had, or the teacher is too far away. It’s an imperfect world, and as much as someone might want to take lessons the circumstances sometimes don’t cooperate. But if you are an adult who has always wanted to learn to play an instrument or a parent who has had in the back of your mind to get lessons for your child, I hope I have encouraged you to try. When the goal is this worthwhile, you shouldn’t give up on it. And it’s never too late to begin. This article is dedicated to my first piano teacher Bonnie, my second piano teacher Doris, my parents who paid for and drove me to all those lessons (may they rest in peace), and my sister Kathy, who would like everyone to know that she was the one who taught me my first song.